This week we have the annual Vogeltown Hangi. It is such a great event! Mr Lancaster and Mrs Sleep are working hard to make it another great success. 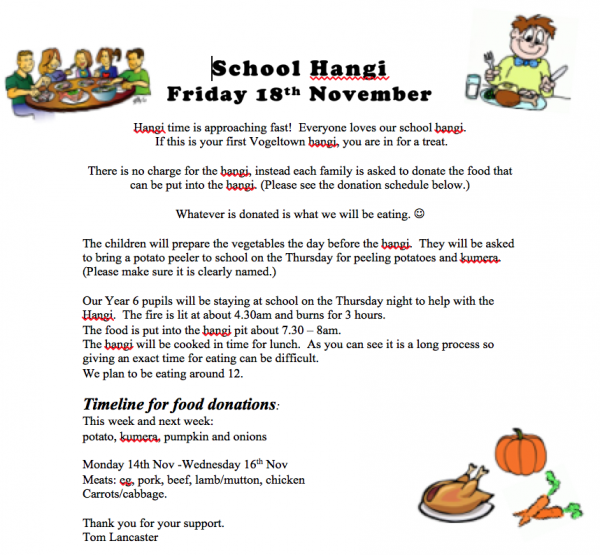 We are after some extra foodstuffs for the hangi, so if you can provide any of the following, please bring them in. We will be lifting the hangi at 11.30am and getting ready to eat by 12.30pm. We will be eating in our whanau’s.